This rather abstract piece is, once again, inspired by Dr Adam Hamlin's images of apoptosis in the basal forebrain. Starting with a piece of black silk fabric, I simply began making stitches more or less at random. The thread is Gumnut Yarns Jewels pearl silk thread in Emerald Light. 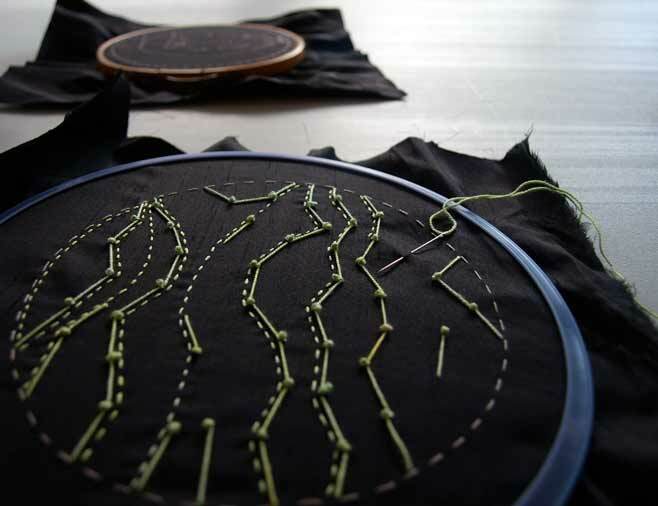 I started with French knots for cell nuclei and long, straight stitches for processes (that's a word I learned in the lab at QBI: it means the structures that look like fibres emerging from the cells). I didn't plan the design: I am just allowing it to develop in response to the spaces and textures that I create as I make the stitches, so I have no real idea what it will look like when it is finished. This kind of free-form stitching is more difficult in some ways than when you begin with a planned design or pattern, because you never really know where you will place the next stitch or, indeed, when you will be finished. I hope to make this piece quite dense with stitches, but my ideas may change as the work continues.